Christine Johnston is a performing artist/vocalist/writer/musician who has created a diverse range of works for events, festivals, art galleries, theatre, film and cabaret around Australia, New Zealand and Europe. Known for her singing and experimental use of voice, dramatic visual style and particular bent on humor, Christine has combined music and performance with her visual arts background in creating stand out work. Christine’s commissioned works include DECENT SPINSTER (QPAC); FLUFF (QPAC); WARM AND FUZZY (QPAC); MYRTLE BY THE WATER (QLD Art Gallery as part of Kids APT) and PIANISSIMO co-created with Lisa O’Neill (QPAC). Christine is co-creator/writer of the multi-award-winning comedic trio THE KRANSKY SISTERS who continue to tour nationally and internationally, including regular television appearances. Their Awards include Sydney Theatre Award 2008, Herald Angel Award for Excellence (Edinburgh) 2006, Australian Mo Award 2005, and The Age Critics Award, Best Newcomers Award, and Green Room Award for Melbourne International Comedy Festival 2004. 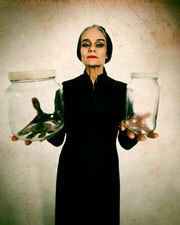 Christine’s one woman show MADAME LARK continues to tour around Australia and New Zealand. As a team of collaborating artists, RRAMP HOUSE, (Johnston, O’Neill and Nelson) have co-created their latest production RRAMP: the Collector, the Archivist & the Electrocrat. Lisa O’Neill is a performer, choreographer, performance director and educator working across mediums in dance, theatre, contemporary performance and new-media. A multi-skilled artist, Lisa has developed a broad body of performance work over the past 20 years. Her solo works have toured nationally and internationally to the United Kingdom and Japan. Significant works include THE PIPE MANAGER (published as a graphic novel through Playlab Press) and THE PINEAPPLE QUEEN. Lisa was a founding and core member of the new media company, TRANSMUTE COLLECTIVE from 1998-2009 presenting interactive art installations in galleries across Australia, Europe, Asia and the United States of America. Lisa worked and toured internationally to Europe and Japan as an actor with FRANK THEATRE from 1995 – 2007 and is co-coordinator and director of the Acting and Performance programs at TAFE QUEENSLAND BRISBANE, having taught at the Institute since 2001. Lisa is a founding and core member of the performance collective RRAMP HOUSE who for the past decade has devised multi-artform performance works touring extensively in Australia, New Zealand, Canada, Hong Kong and the United States of America. Tour-ready productions include PIANISSIMO, FLUFF and RRAMP: the Collector, the Archivist & the Electrocrat. 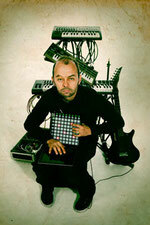 Peter Nelson is an electronic music producer/composer/sound designer/musician and a performing artist. His bands Taxi and The Visitors toured nationally frequenting Woodford Folk Festival, Livid, and The Big Day Out. Peter has collaborated on a variety of theatre, film and sound art projects as musical composer including LIVES AND LOVES (Brisbane Powerhouse); BOREDOM PATROL (Dendy Cinema) and installation piece K:\012044 (QLD Museum). In 2000 Peter began work with Christine Johnston, as musician/performer creating the music score for her highly acclaimed show DECENT SPINSTER (QPAC). A creative partnership was sparked between Christine Johnston, Lisa O’Neill and Peter, when they joined to collaborate on Christine’s first children’s production FLUFF at the Out Of The Box Festival at QPAC. FLUFF has continued to tour nationally and internationally to high acclaim since 2002. Peter is the composer and sound designer for Kite Arts Education and co developed DIGITAL PLAY, a children's music creation workshop featuring at the Out Of The Box Festival at QPAC. He also runs an assisted music program for the Queensland Cerebral Palsy League. Peter is co-creator of RRAMP: the Collector, the Archivist & the Electrocrat. Leila Maraun with her broad technical knowledge and experience works and tours with theatrical productions that require a skilled overseer for lighting, audio and visual elements. 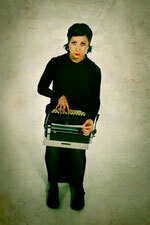 Leila began work in the music industry in the mid 1990’s as a musician, writing and playing in bands around Brisbane. She also has been audio engineer on many live events. In the late 1990’s Leila expanded into the theatre industry on various projects including sound designer for productions such as Closer by Genre and Alive At Williamstown Pier by green. Leila continues to work as a freelance technician in the music and theatre industries touring throughout Australia, New Zealand, UK and Europe. This work includes roles in production, tour and stage management, lighting and sound operation and backline for RRAMP HOUSE, THE KRANSKY SISTERS, FLUFF by Christine Johnston, A-LIST ENTERTAINMENT, QPAC, FOX IN THE SNOW, QUEENSLAND BALLET, STRUT & FRET, La Boite Theatre, Queensland Conservatorium of Music, Brisbane Festival & Queensland Music Festival and East Coast Blues & Roots Festival.